19 March - 16 October. 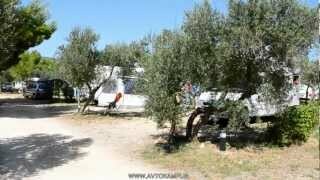 Camping Kovacine is located on a peninsula on the beautiful Kvarner island of Cres, just 2 km. from the town of the same name. The site has just under 1,000 pitches for touring units, most with 16A electricity (from renewable sources) and a water supply. On sloping ground, partially shaded by mature olive and pine trees, pitching is on the large, open spaces between the trees. From the waterside pitches there are far reaching views over the sea to the coast beyond. 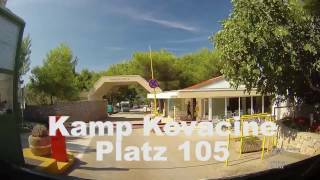 Kovacine is partly an FKK (naturist) site, which is quite common in Croatia, and has a pleasant atmosphere. The site has its own beach (Blue Flag), part concrete, part pebbles, and a jetty for mooring boats and fishing. It is close to the historic town of Cres, the main town on the island, which offers a rich history of fishing, shipyards and authentic Kvarner-style houses. There are also several bars, restaurants and shops. Seven modern, well maintained toilet blocks (water heated by solar power) with open plan washbasins (some cabins for ladies) and free hot showers. Private family bathrooms for hire. Facilities for disabled visitors and children. Laundry sinks and washing machine. Motorhome services. Electric car/scooter charging point. Car wash. Mini-marina and boat crane. Supermarket. Bar. Restaurant and pizzeria (May-16/10). Playground. Daily children’s club. Evening shows with live music. Boat launching. Fishing. Diving centre. Motorboat hire. WiFi (free). Airport transfers. From Rijeka take the coast road E65 towards Senj and Split. After 20 km. 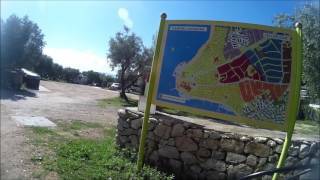 follow signs for Krk island (reached over bridge). Continue on the 102 for 20 km. then the 104 to Valbiska-Merag ferry. From Merag drive to the town of Cres where, at the beginning of the town, site is signed to the right. There is a ferry from Brestova to Porozina but the road on to Cres is only suitable for smaller units.